Many believe that rugby was born in 1823 when William Webb Ellis (See Below) "with fine disregard for the rules of football (note that football was yet to split into the various codes) as played in his time at Rugby school, first took the ball in his arms and ran with it, thus originating the distinctive feature of the Rugby game". Although this is in fact apocryphal, since there is little in the way of evidence to substantiate this view, it is however the popular view. So much so in fact that the international committee named the Rugby world cup the "William Webb Ellis Trophy". The towns first public commemoration of the game of Rugby was unveiled by Jeremy Guscott on 26th September 1997. The bronze statue, by Graham Ibbeson and modeled after his own son, cost £40,000 which was raised by a public appeal. The bronze statue of a boy running with a Rugby ball, cast using the lost wax technique, now stands at the junction of Lawrence Sheriff Street and Dunchurch Road, beside the school and opposite what is now called the Webb Ellis museum. Early Ball Games Various early ball games were played during the middle ages (5th to 16th century) and are sometimes referred to as folk football, mob football or Shrove tide football. Such games would usually be played between neighboring towns and villages, involving an unlimited number of players on opposing teams, who would fight and struggle to move an inflated pig's bladder by any means possible to markers at each end of a town. Authorities would later attempt to outlaw such dangerous and unproductive pastimes. William attended the school from 1816 to 1825 and he was noted as a good scholar and a good cricketer. Though it was noted that he was 'rather inclined to take unfair advantage at football. The incident where Webb Ellis picked up and ran with the ball in his arms during a football match is supposed to have happened in the latter half of 1823. After leaving Rugby he went to Oxford University in 1826, aged 18. Here he played cricket for Brasenose College, Oxford, he went in at number 3 for Oxford at Lords Cricket ground and got 12 runs. After university, he entered the Church and became chaplain of St George's, Albemarle Street, London and then rector of St Clement Danes in The Strand. His mother left Rugby at this point and went to stay with William. When she died he erected a memorial in St Clement Dane's church which said "A mother, whose piety is recorded in Heaven and requires no praise upon earth... Her sprit rejoices in God her saviour. Let my last end be like hers." This memorial was destroyed in the 2nd world war bombing. In 1855 he became rector of Laver Magdalen in Essex where there is now a Webb Ellis stained glass window. 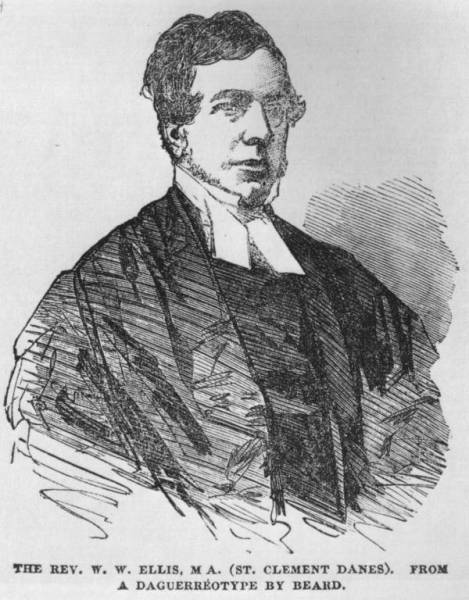 A picture of him (the only known portrait) appeared in the Illustrated London News after he gave a particularly stirring sermon on the subject of the Crimean War. William Webb Ellis passed away on 24 January 1872 and is buried at Menton in the South of France. The sole source of the story of Webb Ellis picking up the ball originates with one Matthew Bloxam, a local antiquarian and former pupil of Rugby. In October of 1876, he wrote to The Meteor, the Rugby School magazine, that he had learnt from an unnamed source that the change from a kicking game to a handling game had "...originated with a town boy or foundationer of the name of Ellis, William Webb Ellis". On 12th December of 1880, in another letter to the Meteor, Bloxam states: "A boy of the name Ellis – William Webb Ellis – a town boy and a foundationer, ... whilst playing Bigside at football in that half-year, caught the ball in his arms. This being so, according to the then rules, he ought to have retired back as far as he pleased, without parting with the ball, for the combatants on the opposite side could only advance to the spot where he had caught the ball, and were unable to rush forward till he had either punted it or had placed it for some one else to kick, for it was by means of these placed kicks that most of the goals were in those days kicked, but the moment the ball touched the ground the opposite side might rush on. Ellis, for the first time, disregarded this rule, and on catching the ball, instead of retiring backwards, rushed forwards with the ball in his hands towards the opposite goal, with what result as to the game I know not, neither do I know how this infringement of a well-known rule was followed up, or when it became, as it is now, a standing rule."